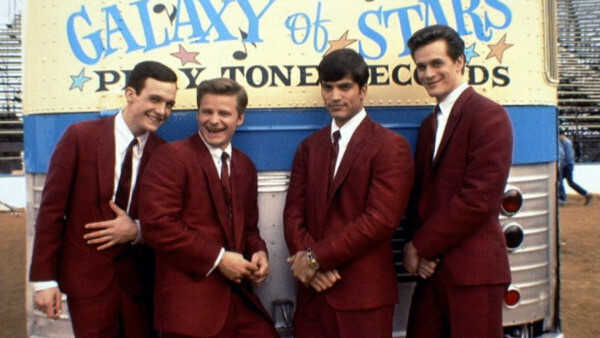 Can You Name These Movies’ Fake Bands? Can there really be such thing as a "fake band"? Sure, there can be performers who didn't actually write the songs, but when the performance is believable enough that the audience buys into the idea, is it really fake? To paraphrase comedian Patrick Monahan, That Thing You Do! needed a song that was so believable as a one-hit wonder, they constructed an entire movie around it, and the guy from Fountains of Wayne basically said "...here". Some of the catchiest and most well-known songs in recent history are so-called "fake songs", written by so-called fake singers and bands. Even The Monkees, a band engineered for a TV series, had #1 hits and sold over 75 million records. But if the song is good, maybe that's enough? Regardless, protect your drummers and properly assembly your Stonehenge models, because movie and TV's bands are some of the finest around... providing you know who's who. 1. What's The Band From That Thing You Do! Called?